Have you ever wondered how your favourite websites are built? How do professional web designers transform your project requirement into a functional website? This article will briefly discuss Closely Coded’s web development process in six steps. Hopefully it can give you a general idea about our web creation methods, and the measures necessary to make a compelling website. Once the website objective is clearly defined, it is time to draft a design which will carry that objective. 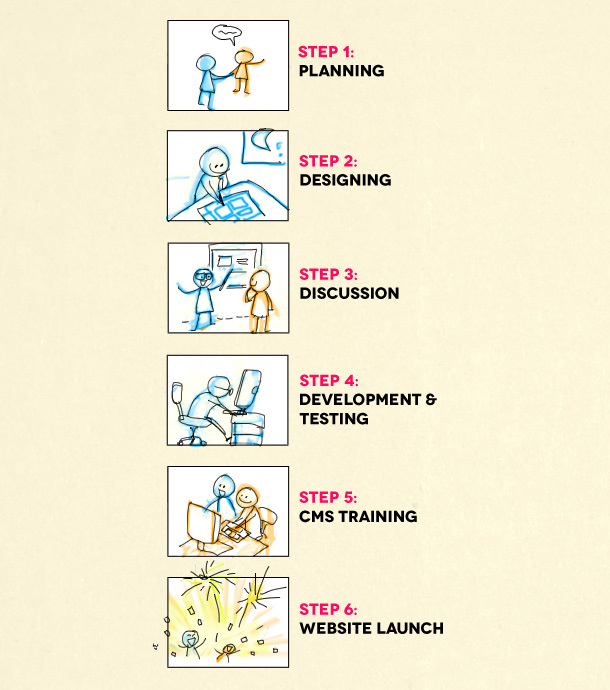 The design process can be divided into two parts. Part one is wireframing, which means mapping out the blueprint of the site. After the wireframe is complete we move on to part two, which is working out the visual aesthetics (such as graphics and typography) to create a finished website mockup. The finished website mockup is presented to the client. We explain the rationale behind our design decisions, then take note of client’s feedbacks and comments. A revised website mockup will be made based on client input. Once the website mockup is approved, our development begins. The development includes slicing, coding, and integration with CMS (content management system). The finished website is then meticulously tested to make sure it runs correctly on major desktop browsers and mobile browsers. The fully functional website is presented to the client. At this step, the website is still hosted in our staging server, and has not been published live yet. During this session, a brief CMS training is provided for our client so that he/ she will be able to easily update their website contents on their own. The website is published live on the specified launch date. We then continue to assist our clients by providing maintenance for their website. Does your business need a website? We are more than happy to help.